Cooling and heating our buildings accounts for 30% of global energy consumption (1). The vast majority of this energy comes from burning fuels with an impressive negative result on the environment and economy (2). Lighthouse Group has developed a new patented method (8,9) to collect the solar energy in the form of high temperature thermal energy. 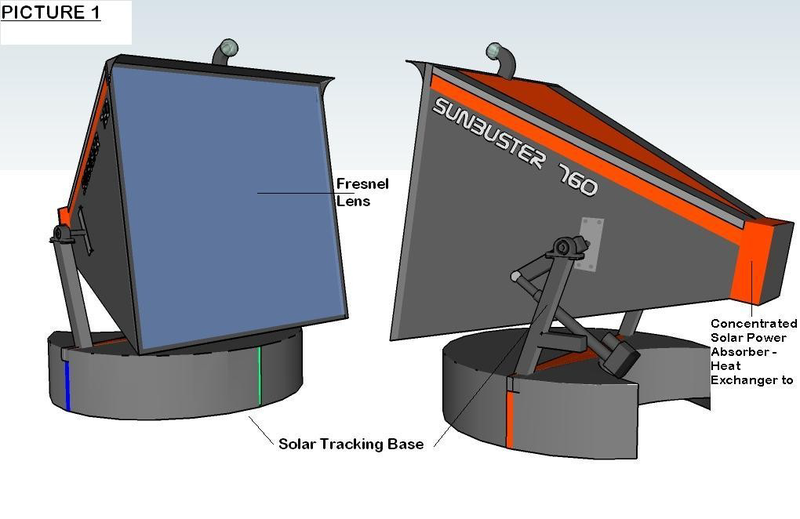 The robotic Lighthouse Solar Collector (LSC) uses Fresnel lenses and solar tracking to concentrate the solar energy, and point focus to absorb it in the form of high temperature thermal energy, with high efficiency (>70%) even at high temperatures (4,5,6), without using vacuum. Up to now the available technology consists of photovoltaic PV , the classic flat plate thermal collectors and the evacuated tube thermal solar collectors (3). But these solutions do not address the problem effectively , and the use of solar energy in heating and cooling in buildings is less than 1% (13,14). 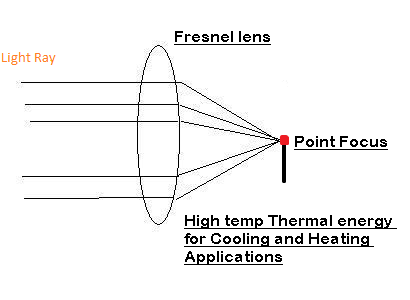 For the first time Fresnel lenses (and not concave mirrors) are used to concentrate the solar energy and produce thermal energy that can support thermally driven applications (heating/cooling) in buildings at the local distributed level and, with double or triple efficiency than the current solar systems. LSC can reduce the use of steam and chilled water of MIT’s campus buildings up to 60% with a payback period of less than 5 years , without government subsidy. LSC coincides with the MIT’s Solar Center intention to “explore new system concepts for concentrated solar power” as well as with the “evaluation and deployment of sustainable roof strategies” on the roofs of MIT’s buildings that will be renewed in the following years (12). Moreover we are very much eager to share what we know and learn from others around the world in order to fine tune our solution, as well as to use the demonstration capacity of MIT to model, scale, and deploy the innovative concentrated Lighthouse Solar Collector in a complex urban environment. We have also noticed from the Space Boundaries Maps and from Google maps that the buildings have a lot of space on their flat roof tops, with a general good South direction. Supply heating from the sun to the distribution system in order to reduce the need to operate the auxiliary boiler and the three Electric Driven Chillers or the need to purchase electricity , steam or chilled water (10)(Scope 2 of GHG Protocol (11)). Supply heating and cooling from the sun, to the buildings of the campus that are not connected to the Cogeneration Plant (10,11) (Scope 3 of GHG Protocol (11)) . Moreover supply heating and cooling to the transmission and distribution system in order to substitute its losses with solar energy and not with burning gas (Scope 3 of GHG Protocol (11)). An adequate number of LSC are installed on the roof of the building that are connected to an absorption chiller. The LSC provides the thermal energy that is needed to the absorption chiller in order to produce the heating and cooling. The building uses the steam, and the chilled water from the cogeneration plant only when the power provided from the LSC is not enough. This way we achieve to reduce the consumption of steam and chilled water directly from the buildings with decentralized production of heating and cooling, using solar energy. An adequate number of LSC are installed on the roof of the buildings and are connected to the return lines of the steam towards the cogeneration plant and the heat exchanger (10). The steam has a lower temperature after it has been used from the buildings. In order to gain some of the lost temperature (thermal energy), it passes through an array of LSC and returns to the cogeneration plant warmer (more thermal energy). As a result less energy is needed to prepare the steam again to be directed to the buildings or to the Steam Driven Chillers. Depending on the weather the need to burn gas in the auxiliary boiler will be reduced a lot. If the collectors are placed near the cogeneration plant they can warm up again the steam used by the Steam Driven Chillers and this way reduce the need to use the 3 Electric Chillers (10). In this case the gains will be higher since the time of the big load (need for cooling in the buildings) is when the production of LSC will be higher. In other words the more warmer the weather is the higher is the demand for cooling , the higher is the production of LSC. If the building is not connected with the Cogeneration Plant ( leased buildings), LSC can provide the thermal energy that is needed to the absorption chiller. If the solar energy is not enough the absorption chiller burns natural gas that it is according to the plan to use only natural gas in the campus (12). Moreover there can be peripheral installations of producing heat and chilled water from the sun using LSC and absorption chillers, that feed the transportation and distribution system. As a result to substitute the losses of the distribution system with solar energy and add energy to the system (heat or chilled water to the system). With the above actions and the available space on the buildings of MIT campus we believe we can substitute at least 15% of the thermal energy that is produced in the cogeneration plant from burning gas with solar energy, while maintaining all the merits of cogeneration (10). Measure or calculate the building’s energy losses, in order to define the size of installation. 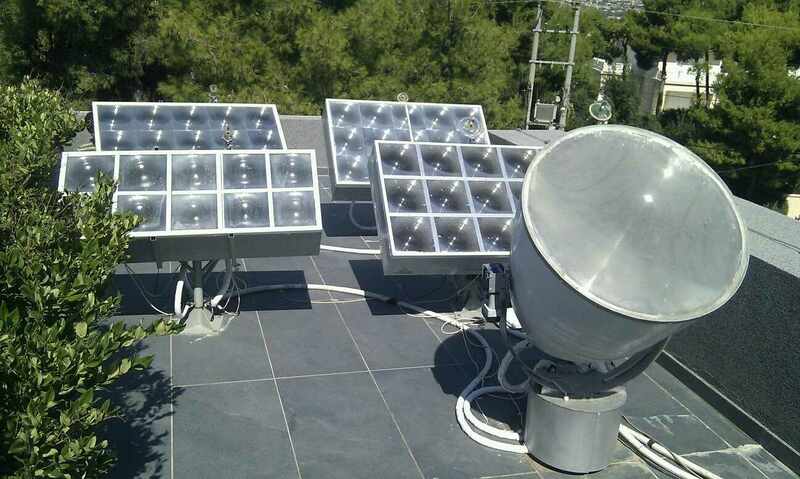 Install adequate number of Lighthouse Solar Collectors (LSC) on the roof. Connect the LSC to the current heating system. Because the LSC can achieve high temperatures can be connected directly to the burner (petrol/gas) without the need of storage. Install an Absorption Chiller of adequate power. The Absorption Chiller can produce heating and cooling and consumes gas not electricity. Connect the LSC directly to the Absorption Chiller and substitute the gas that it consumes to produce heating and cooling, with solar energy. Connect the whole system to a smart weather compensated cooling/heating control system (the temperature of the fan coils will change depending how much cold/hot is the space inside the building and how cold/hot is the weather outside). Connect the whole system to the internet with Smart wireless sensors/switches (Bluetooth 4.1, wifi) so the students and potential users from all over the world can monitor how the system works, how much the greenhouse gases are reduced and how much money were saved and serve as a source of practical knowledge of using the solar energy for heating and cooling buildings. The Lighthouse Solar Collectors with solar tracking are directed towards the sun from early in the morning until late at night. The Solar energy is concentrated through the Fresnel lens (front window) on their absorber/heat exchanger (high efficient because its small size and mass), that it gets very hot fast and the heating medium (water or oil) passes through it and the Absorption Chiller. The heating medium is “preheated” and the Absorption chiller is using up to 60% (without storage, the building itself can be used as a mean of storage) less gas in order to produce the same volume of heating or cooling. Imagine during summer with so many hours of sunshine how much energy can be produced in the form of cooling. The more intense sunshine and warm weather, the more the greenhouse emissions will be reduced and the most cooling will be produced substitute the Electric Driven Chillers (10) of the campus to a great extend and reducing a lot the GHG emissions(11)! Our general direction is, to add energy to the 80% that is produced from the Cogeneration Plant (10), to minimize the need of the Auxiliary Boiler to produce steam and the use of the 3 Electric Driven Chillers to produce cooling (10). Our aim is that the steam that is produced in the Cogeneration Plant from the turbine that produces the electricity, to be enough together with the solar energy and the peripheral absorption chillers to cover the needs of the MIT campus and minimize the need to purchase (electricity) or produce (burn gas) more energy. We understand that the sizing and the placement of such an installation on the 100 and more campus buildings with different occupation levels and needs , is a big project by itself. 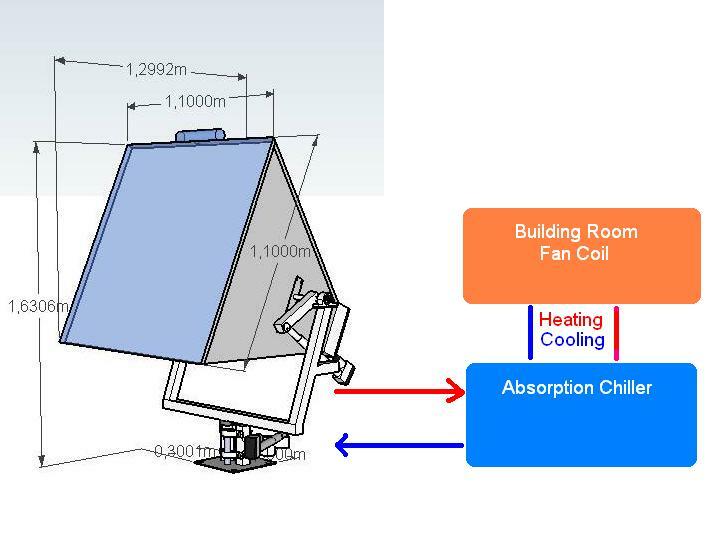 What can be done in the following months is a limited scale installation (LSC and absorption chiller connected to the heating/cooling system of a building) that will serve as an example and as a test bed for all buildings around the world, whether are connected to district heating and cooling systems or not. We have reached Technology Readiness Level of 7 according to NASA definitions (7) and we have already perform test installations in house heating systems, where the potential problems in the moving base , solar tracking etc were identified and corrected (15). We have also performed efficiency measurements in collaboration with the Hellenic Center for Scientific Research "Demokritos" (16). 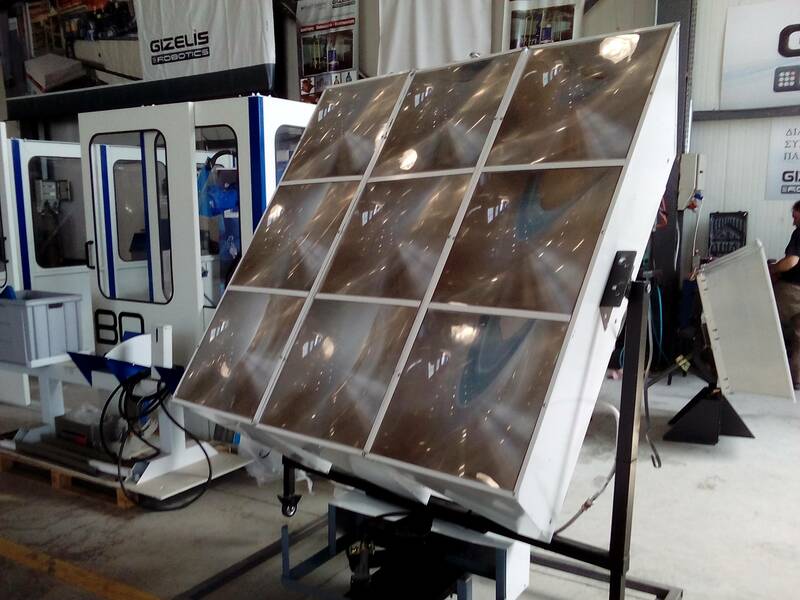 We have also developed different models of the Lighthouse Solar Collector with different size Fresnel lens, bases etc., in order to match the needs of different buildings (15). We are in a good position and we have the experience to do the manufacturing even outside Greece , using manufacturers and related companies in the area of MIT. We need the help of MIT to provide the space and the building with the Fan Coils and the Absorption Chiller equipment. We also need the MIT to make the study and the sizing of the Installation as well as to provide labs and related equipment. Further planning should be done in collaboration with MIT staff, students and faculty. and we use Absorption Chiller to produce the heating and cooling with Coefficient of Production 0.8 , then we can achieve 60% reduction in the annual gas consumption. So if only Absorption Chillers were used , 36 Cubic feet of natural Gas would be consumed producing greenhouse gas. With such an installation we could substitute 60% of these fuels with solar energy namely 21.6 Cubic feet of natural gas every year per 100 square meters of building. The above are rough estimations and more study is required. Such a solution can also be adjusted to fit applications in food industry like pasteurization, in pharmaceutical industry, paper industry (13) etc. And last but not least can be effectively be used for water desalination and sterilization. Through boiling water, water is cleaned without the use of electricity and with a very low cost. 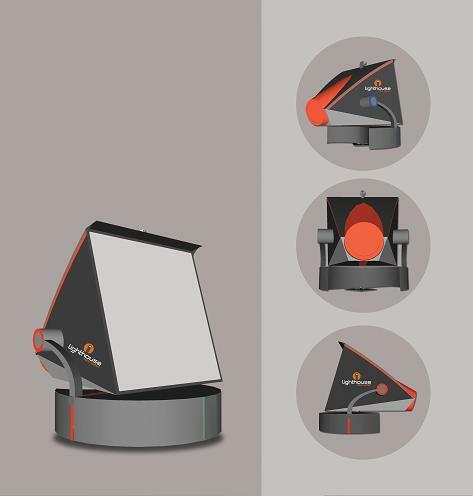 Moreover the highly modular character of the Lighthouse Solar Collector , allows it to be used for personal use in remote places, such a Fresnel lens could be fitted in a backpack , to big installations to support the water demand of villages. Lighthouse Solar Collector has a small cost, assuming that there is an organized small production , a Lighthouse Solar Collector capable to support up to 60% the cooling and the heating of a 50 square meter building , will cost around 2.000 $. Considering the price of fuels and generally the cost of energy around the world, its cost can be paid back in less than five years. With a small cost LSC transforms the building's roof to a petrol or gas well. Also there is a cost for the purchase of the absorption chiller that it should be considered , but again its cost is paid back in a short period, and the use of gas that it uses to produce the heating or cooling, relieves the cities electricity grid and reduces the emissions of green house gases. Also there is a maintenance cost. Because the Lighthouse Solar Collector is an active system and not a passive one like the solar collectors that we know up to know, it may need a maintenance schedule. From the installation that we have already made we calculate that this cost will be in the range of some dollars per year per collector. It is designed in a way that all parts to be easily replicable with a durable simple construction that can stand the wind and rain for years. We have also developed a fail proof solar tracking system without the use of calendars and GPS. 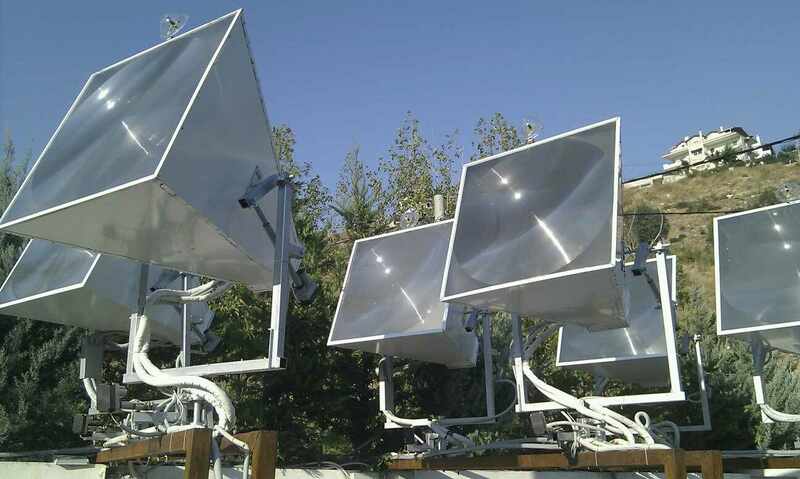 Ideally the whole system could be connected , with a low cost to internet, in order not only the good operation to be monitored but also to make corrective actions from a distance (for example correct the orientation towards the sun, we have already develop such a system). We have recognized the need of the buildings for thermal energy and the potential of the sun to provide it, when we patented (8,9) the Lighthouse Solar collector back in 2006. At that time the focus was on photovoltaic system and the big need for heating and cooling of the buildings was neglected. Now the need of the buildings is characterized by the European Renewable Energy Council as “a sleeping giant” and is coming in focus at last (3). We expect that the use of solar energy in the buildings will be expanded rapidly, in terms that we can’t really estimate because there are millions of buildings all around the earth that could be benefited of the Lighthouse Solar collector (LSC). What we know is that LSC can be easily manufactured from common raw materials, and electronics, can last for many years, and it can easily be manufactured and installed in different countries.. The technology needed to build and install such a system, is spread all around the world and there is no limitation in adopting this solution fast, and tackle effectively the climate change problem ,and other everyday problems like the cost of energy, the air quality inside the cities and the desalination and cleaning of water and others. 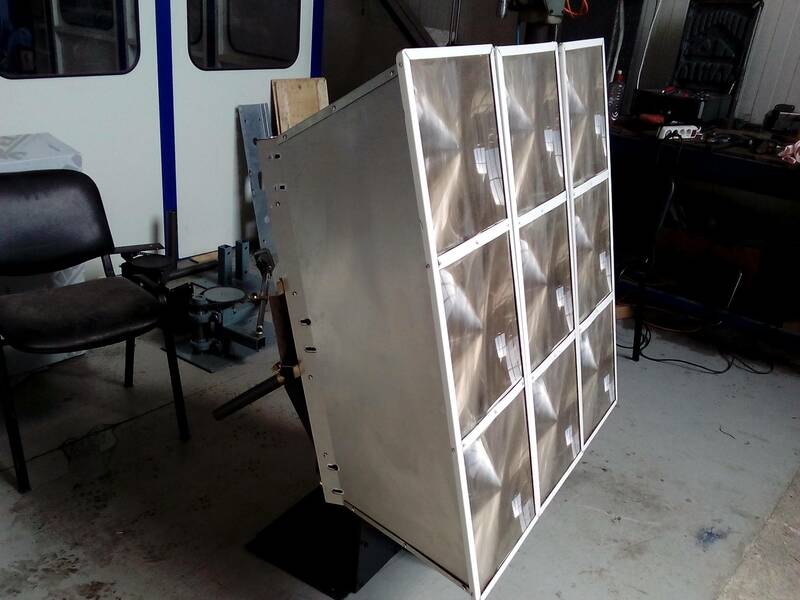 It will be a matter of a couple of months to manufacture, install and connect Lighthouse Solar Collectors on the buildings of MIT, that can be a good example for all the world, of an efficient solution to a major energy and climate problem.